Salvador Perez's first career grand slam off Robby Scott in the bottom of the eighth inning sent the Red Sox to a 6-4 loss against the Royals at Kauffman Stadium on Wednesday afternoon. Matt Barnes and Scott walked three consecutive batters without an out in the eighth before the Perez blast. 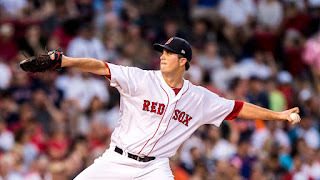 Drew Pomeranz (pictured) started for Boston, going 6.1 innings in the no-decision outing. He allowed the first two KC runs on six hits and a walk while striking out five. The Royals took an early 2-0 lead with single runs in the second and third innings off Pomeranz. Boston answered back with back-to-back home runs in the fourth by Andrew Benintendi and Xander Bogaerts. The Red Sox padded the lead with two more runs in the top of the fifth on a sacrifice fly by Mookie Betts and an error by first baseman Chesler Cuthbert.